Wine’s Hidden Beauty | Sondra Barrett, Ph.D. | Sondra Barrett, Ph.D.
Wine’s Hidden Beauty will guide you through the inner evolution of grape juice into wine. You can see how it changes from simple geometric forms into greater complexity. A wine losing vitality is also expressed by its photomicrograph. Beyond the visual expressions of wine, we explore ideas such as does wine have a soul, what shapes our taste, and the role of wine in health. Here you will discover hidden messages written in the visual language of wine and taste. Explore the diverse personalities of wine. Deepen your pleasure of wine. Next time you taste some wine new pictures or words may come to mind. Explore your imagination and perceptions of taste as you share a wonderful glass of wine with a friend. Thanks to all the wineries, businesses and people who helped almost selling out our first edition. A few more copies have been found so get them while you can. Purchase your personally signed book here. Only a few copies left. As a winemaker for more than 50 years, I’ve always felt that making wine is much like raising children: You have to love and guide them and transmit to them the richness of your spirit. Now “Wine’s Hidden Beauty” presents dramatic proof of what I’ve long believed, but could only feel: wine has a secret life and inner beauty that transcends its chemical components. Dr. Barrett’s portraits of wine are a wonderful addition to our understanding of the art, science and spirit of wine making. Unique books on the subject of wine are a rare find these days. This is certainly one of them. For those who enjoy drinking wine, and relish the art and science behind its magic, Sondra Barrett has taken us to another level. Whether for its insight into the history and culture of the grape, and its evolution into the lifestyle of the world’s great cultures, or for its penetrating view into the visually stunning molecular world within, “Wine’s Hidden Beauty” is a journey into wine that you will thoroughly enjoy. Twenty years in the making, the book’s vintage is about right. The Most “Unusual” Wine Book Ever Produced – Astonishing. Gerard D. Launay – Amazon review. Highly recommended. As a student of geology, it was routine for me to study rocks through a “polarizing microscope”;the thin slides of minerals created a kaleidoscope of brilliantly colorful images. I never thought of viewing tiny drops of wine through the microscope….but obviously Sondra Barrett did. What a revelation. But this book is more than just a collection of photos that puts a new spin on wine. It is also a love letter to wine itself – and to its life giving properties. My favorite quote in the book is a discussion of Pasteur – “He showed that fermentation was due to life, thereby confirming an instinctive and almost universal belief that wine was not a mere chemical concoction, but a mysterious living organism, divinely appointed as the symbol of life.” Many of my friends are drinkers of lovely wine….this book could be a sensational gift to these friends and others who think they know everything about it. An educational, fun, incredibly beautiful piece of work; Barrett openly shares the art, soul, and life pleasures of wine. Now, I know you’re not supposed to judge a book by its cover, but without even opening up to the first page, I knew it was going to be awesome! I’m sure you are all aware: I’m somewhat of a nerd, so seeing a magnified image of the molecules of wine, in full color and all its “butterfly glory” made my heart skip with excitement. The book is loaded with big, beautiful photographs of all types of wine (old, young, red, wine, etc) that leave you stopping to try and “taste” the wine pictures with your minds’ palate. In a way, this book was almost just as much a journey through the personal evolution of Sondra Barrett as is was about the science and romance of wine. Throughout the book, I frequently found myself reflecting on my own thoughts and experiences, and how wine has transformed the relationships in my life (to humans, animals, and nature itself). The book almost had me in a state of bliss while reading it, which I think is partially owed to the mystical experiences one receives through wine. I also found myself wanting to drink wine as I turned through the pages! This book is great for both the wine expert and the wine novice, and provides a great many photographs of incredibly beautiful images of the molecular structures of wine. It’s a book that won’t take you long to read and looks wonderful on the coffee table as a piece of entertainment for your guests. “The grape fulfills her promise to help us humans’ open to happiness and a deeper connection with all living things. Her spirited life engages ours. The spirit of the grape shows life in microcosm and macrocosm. When we peek into the inner life of this spirited potion we see the story of life. A big “thank you” goes out to Sondra Barrett for sending me a copy of this book to read and to cherish. Just when you thought that wine has been analyzed form pretty much every angle possible, along comes Philadelphia native, biochemist PhD and former medical research scientist Sondra Barrett. Sondra’s journey to wine seems spiraling and circuitous: Originally a researcher on human leukemias, she was asked to photograph a patient’s leukemia cells, which lead to her presenting slide shows of normal and abnormal cell comparisons at oncology clinics. After attending a photographic exhibit of chemicals of the brain, Sondra noticing an artistic quality in the brain chemical photos decided to try similar photographic techniques on molecular structures in nature. And the images in this book (Sondra sent me a review copy) are, simply put, extraordinary. One of the most interesting aspects about Wine’s Hidden Beauty is the repetition of patterns that Sondra has unearthed in those hidden molecules, where excellent older vintages of Cabernet Sauvignon take on similar complex forms, sharp edges define crisp, refreshing white wines, and even malolactic fermentation shows a telling pattern. In other words, Sondra’s book might just be revealing the “shapes” of taste. it’s the kind of book that you don’t even need to read to have it change your perspective, and a rare case in which the cover (Which features a photo of Muscato Azul) does indeed accurately judge the contents. If you find yourself saying “WOW” at the cover, then this book is well worth your time. 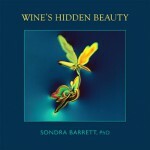 Wine’s Hidden Beauty by Sondra Barrett, PhD, is a walk in the wilds of a microscope. Sondra delivers the heart and soul of wine like we’ve never experienced it before… Or have we? Have we journeyed to the life that exists within a bottle of wine intuitively before, but just not recognized it in our conscious minds? Amid the splendor of the visuals of this book, you’re also going to do a bit of soul searching… At least, I did. Andre Tchelistcheff said to Sondra about her images, “They are the jewels in wine. Put them on silk scarves.” (I agree. )Sondra thinks of wine as a nurturing community as she travels through molecular structures and the inner magnificence of wine. For instance, she’s discovered that wine’s molecular shapes grow larger as they age, and lose vitality and form as they decline in age. Her microcosmic images are a replication of our own life forms; and yet, her world is not one that we would readily recognize, not without her expertise. Her thoughts are well written in her book… As she searched for Wine’s Hidden Beauty, the soul of wine was reflected back to her. With those revelations, she was able to capture the essence of wine’s being, and parallel that to humankind’s own life cycle. Her revelations explore the essence of life.